I was planning on making sweet and sour tofu with oranges tonight, using a variation of a recipe shared by our alfalfa sprout supplier, Jonathan’s Organics. The plan was to swap the canned mandarin oranges for the fresh oranges supplied in our recent pickup. I think after making the marmalade and orange beef, my boys were reminded of the oranges we had left. When I went to look, the remaining oranges were, as my dearly departed Pappy used to say, “solid gone”. I’ll save the now TBD tofu dish for the “Honorable Mention” day, and instead I’ll turn to the remaining russet potatoes for inspiration. Who doesn’t love French fries? Crispy sticks of deliciousness that you can eat with your fingers? Just be careful not to accidentally nibble a finger when devouring these! 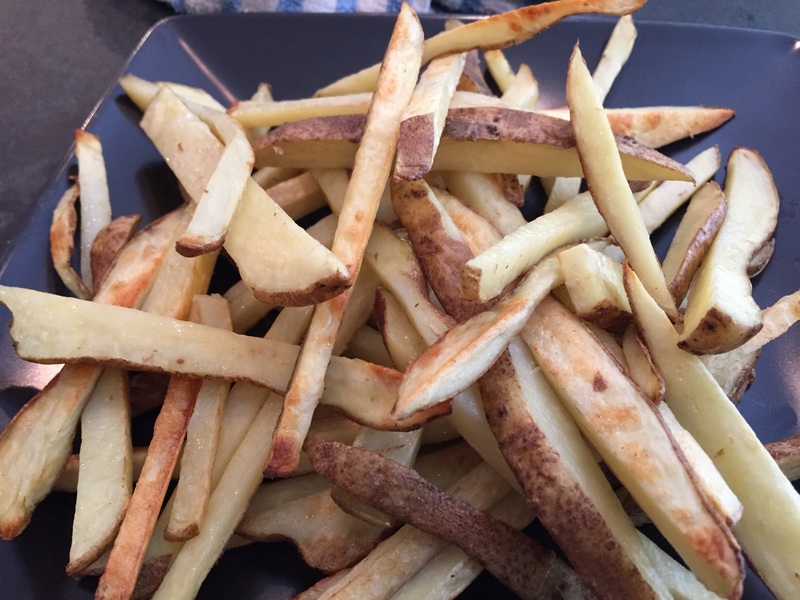 All you need is a little olive oil, a good potato, and a pinch of coarse salt to make a fry that is much healthier (and dare I say, tastier) than it’s deep fried cousin. Begin by preheating your oven to 425. 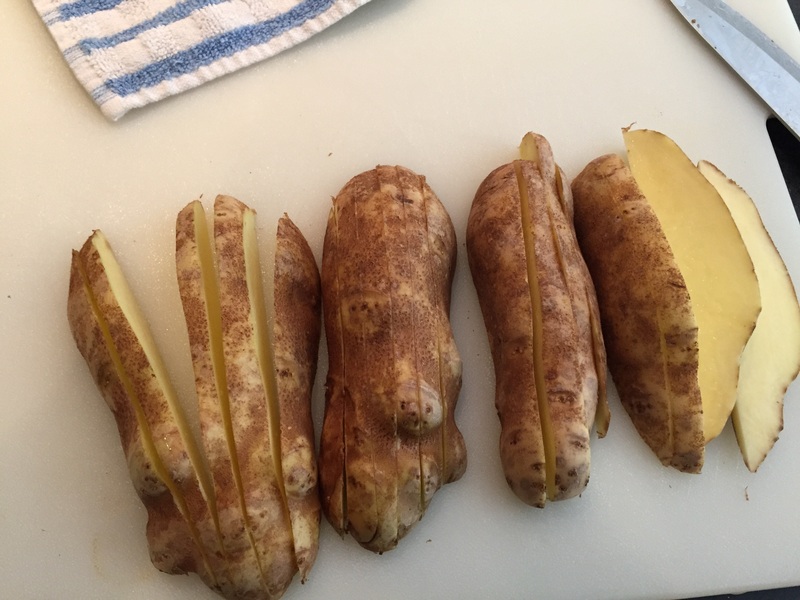 While that’s happening, scrub your potatoes, making sure there are no eyes or blemishes. 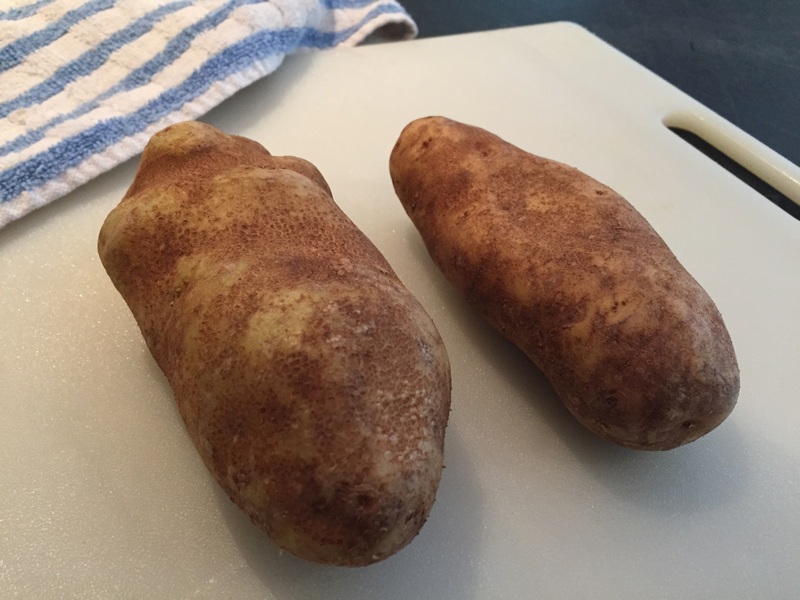 Using a good knife, slice your potato in half lengthwise. 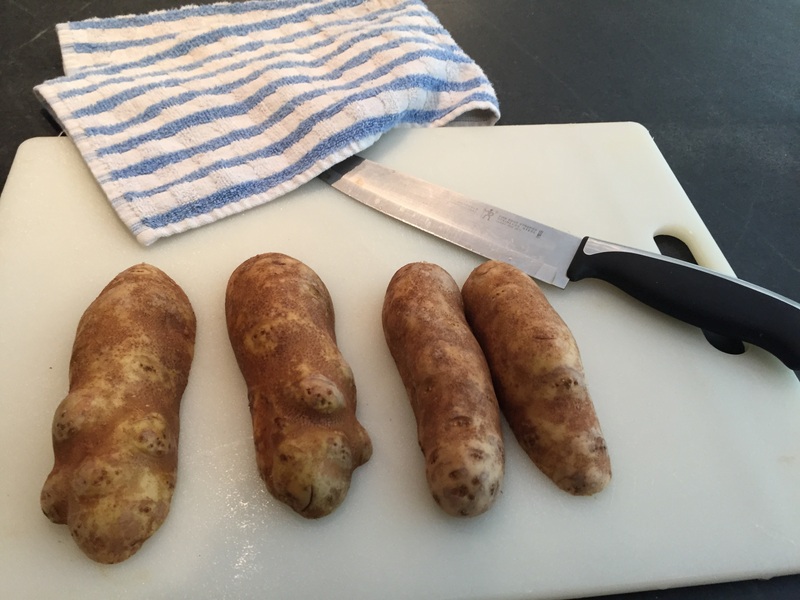 Place the flat sides down on your cutting board before carefully slicing the rest of the potato lengthwise into 1/2 inch slices (or slightly less). Lay those slices flat and cut them lengthwise into 1/2 inch sticks. A little size variation is ok. The next part depends on how low-fat you want your fries to be. 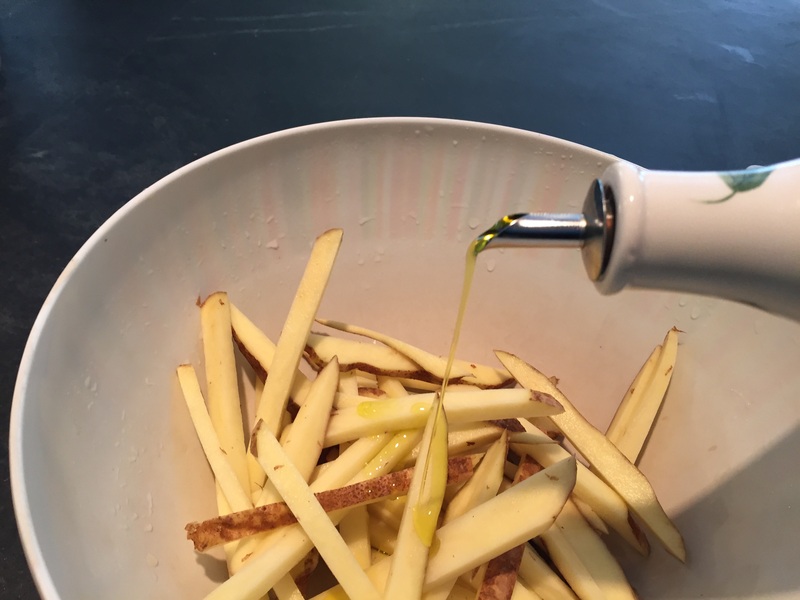 Place your fries into a large mixing bowl and toss with a drizzle of olive oil until just coated, about 1-2 teaspoons per potato. Sprinkle in a pinch of salt and toss again. Lightly spray your rimmed baking sheet with cooking spray to prevent sticking. 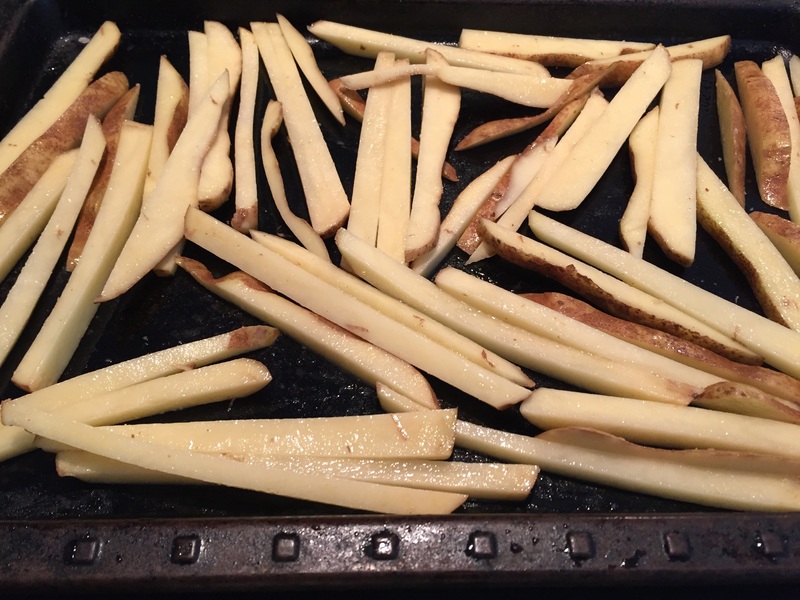 Arrange your fries in a single layer on the baking sheet (for crispiness-otherwise the ones piled on top get a little soggy). 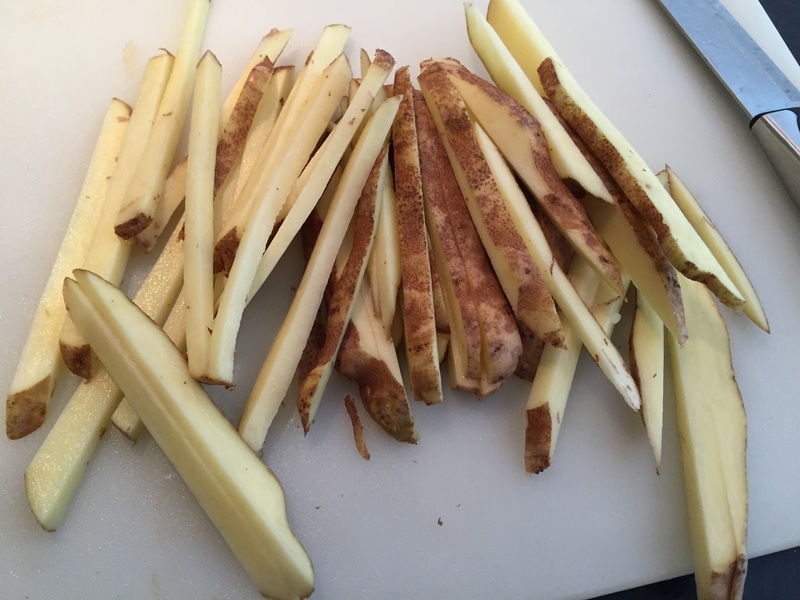 As the Springdell season progresses, you’ll find that you can toss these fries with other herbs and spices of your choice. 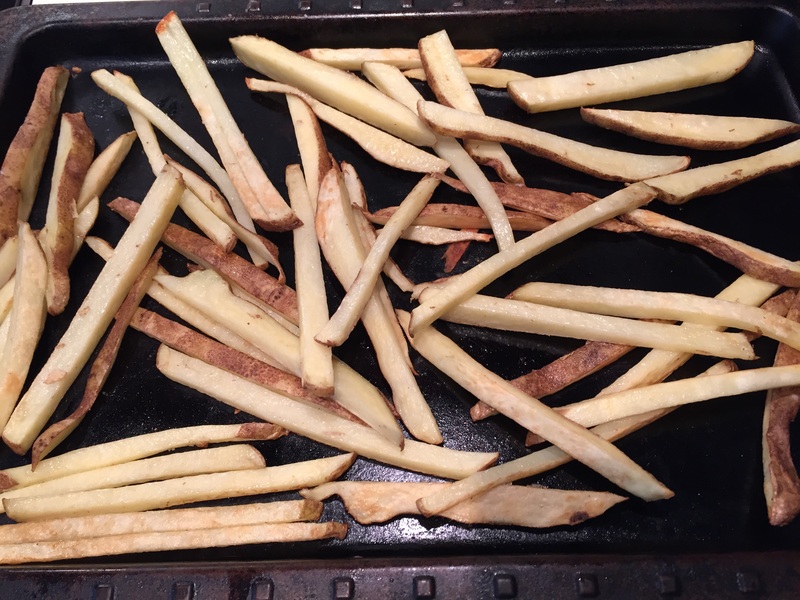 I’ve made a browned butter sage version, a rosemary garlic version, a chile cumin lime version, a lemon pepper version, a honey Sriracha version… This recipe also works great with sweet potatoes, kohlrabi and rutabaga. The options are only limited by your imagination! Get creative, enjoy, and as always, please share your experiences here so that we can all learn together!